1. First among the list of my personal definition of 2009's "important events" would be the publication of two books (and the announcement of a third) that highlight the work of the Picasso of late 20th Century comics, Harvey Kurtzman (I told you it would be personal). 2. Sad-important would be the death of the (sporadically) regular print publication of The Comics Journal â€“ after... 33 years? Jesus Christ! â€“ in addition to the beginning of TCJ's (hopeful) resurrection in the digital realm. 3. Speaking of hope in the face of change, next on my list would be this year's San Diego Comic-Con Spotlight-ing of Denis Kitchen and Bill Sienkiewicz, demonstrating the event's continued acknowledgement of comics as an artistic endeavor (despite its ever-increasing treatment of the medium as a vestigial appendage to the marketing of mainstream movies and other pop culture paraphernalia). 5. 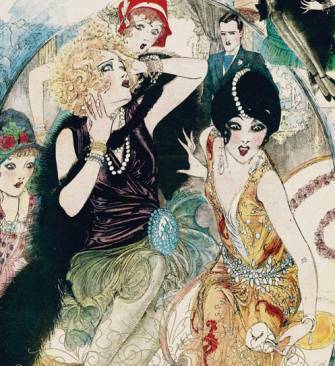 Last would be the San Francisco art exhibition and the lavish hardback honoring -- at last -- the exquisite illustration talents of Nell Brinkley.